Cord cutting isn't just for TVs. In America, landlines aren’t the norm anymore. 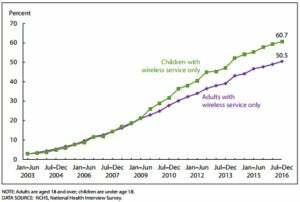 A recently released survey from the Centers for Disease Control and Prevention (PDF) estimates that during the second half of 2016 50.8 percent of U.S. households were wireless only. That’s up from 48.3 percent during the same time period in 2015—a rise of 2.5 percentage points. The story behind the story: It might seem odd to hear that the CDC is tracking phone usage, but there’s actually a good reason for it. Every year, the CDC conducts a face-to-face survey with 40,000 households called the National Health Interview Survey. Since 2003, the NHIS has monitored what kind of phone connectivity respondents had: landline or mobile. This data gives the CDC useful information that correlates to the health status of people without landlines. But beyond the health implications, the CDC’s phone data tracking is useful to monitor the trend of households going mobile only. The CDC’s findings line up with financial reports from telecom providers that are a seeing a decline in landline phone revenue, as Fortune reported. With mobile devices—and smartphones in particular—becoming so common, many families inevitably have the discussion about whether their landline is worth keeping. For some it is, but for more and more families it isn’t. Why have a landline, after all, when your mobile phone is always attached at the hip? Cost is also a factor. More than 70 percent of all adults between the ages of 25-34 and other adults who rent homes had wireless-only households, the CDC said. The government agency also found that 66.3 percent of adults living in poverty and 59 percent of those in near poverty were more likely to be mobile-only households than higher income homes, where the percentage was 48.5 percent. Another interesting tidbit: Mobile-only folks tend to be smokers and binge drinkers, as NPR reported. In the May 2017 study, the CDC said that “adults who had at least one heavy drinking day in the past year was substantially higher among wireless-only adults”—about 30 percent. They were also more likely to be smokers. At the same time, however, the CDC said that wireless-only adults were also more likely to describe their health status as excellent or very good, more likely to meet the 2008 federal physical activity guidelines for aerobic activity, and less likely to have been diagnosed with diabetes.